146:4.3 Late on the afternoon of the third day at Iron, as Jesus was returning from the mines, he chanced to pass through a narrow side street on his way to his lodging place. 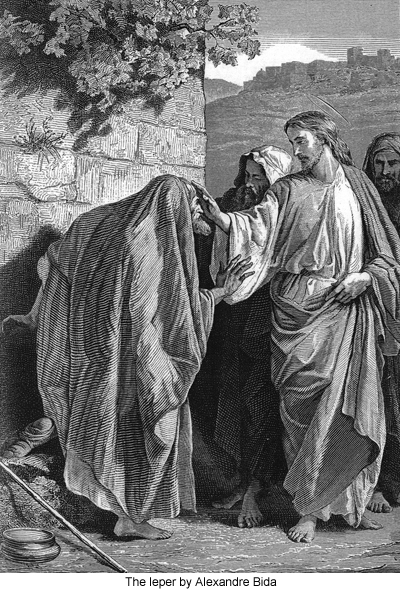 As he drew near the squalid hovel of a certain leprous man, the afflicted one, having heard of his fame as a healer, made bold to accost him as he passed his door, saying as he knelt before him: "Lord, if only you would, you could make me clean. I have heard the message of your teachers, and I would enter the kingdom if I could be made clean." And the leper spoke in this way because among the Jews lepers were forbidden even to attend the synagogue or otherwise engage in public worship. This man really believed that he could not be received into the coming kingdom unless he could find a cure for his leprosy. And when Jesus saw him in his affliction and heard his words of clinging faith, his human heart was touched, and the divine mind was moved with compassion. As Jesus looked upon him, the man fell upon his face and worshiped. Then the Master stretched forth his hand and, touching him, said: "I will; be clean." And immediately he was healed; the leprosy no longer afflicted him. 146:4.4 When Jesus had lifted the man upon his feet, he charged him: "See that you tell no man about your healing but rather go quietly about your business, showing yourself to the priest and offering those sacrifices commanded by Moses in testimony of your cleansing." But this man did not do as Jesus had instructed him. Instead, he began to publish abroad throughout the town that Jesus had cured his leprosy, and since he was known to all the village, the people could plainly see that he had been cleansed of his disease. He did not go to the priests as Jesus had admonished him. As a result of his spreading abroad the news that Jesus had healed him, the Master was so thronged by the sick that he was forced to rise early the next day and leave the village. Although Jesus did not again enter the town, he remained two days in the outskirts near the mines, continuing to instruct the believing miners further regarding the gospel of the kingdom. 146:4.5 This cleansing of the leper was the first so-called miracle which Jesus had intentionally and deliberately performed up to this time. And this was a case of real leprosy.